It appears that Adidas is not quite finished ruining basketball uniforms across the nation: today the company unveiled its new "adizero uniform system," which six college teams—Cincinnati, Kansas, Baylor, UCLA, Louisville, and the Notre Dame Doublemints—will wear for conference play in March. 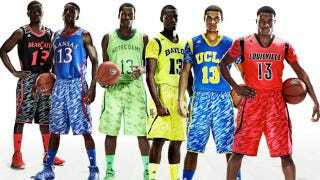 Baylor, Louisville, and UCLA will wear jerseys that have sleeves, for some reason. All six of the teams will be wearing cutoff Zubaz pants, for some reason.